Voigtlander Bessa T or IIIf ? Unique inexpensive compact lightweight M camera with long rangefinder base and the ONLY M camera with built in diopter adjustment in the rangefinder! Voigtlander Bessa T or updated IIIf ? OK, suppose you love the classic Leica IIIf, but want to update it. How would you do that ? Hmmm. The Bessa T has all of these features..... did Mr. Kobayashi have the Leica IIIf in mind when he designed the T? The major conceptual difference between them is the 50 finder. The IIIf's body has a built in 50 finder, but uses auxiliary finders for all other lenses. The T has no built in finder, and uses add on finders for ALL lenses.....but remember the T's add on 50 brightline is better than the IIIf's built in 50 finder. Hmmm. 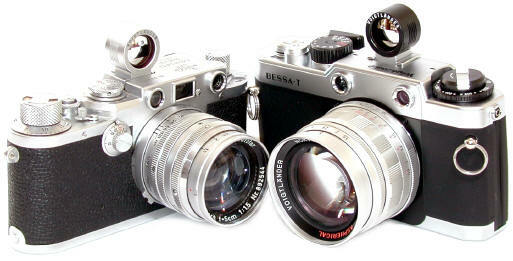 The Bessa T was discontinued 5/1/2004. Yet another way to look at the T is as a M mount Bessa L with a long base rangefinder added. hmm. Revised: September 11, 2017 . Copyright © 2001-2006 Stephen Gandy. All rights reserved. This means you may NOT copy and re-use the text or the pictures in ANY other internet or printed publication of ANY kind. Information in this document is subject to change without notice. Other products and companies referred to herein are trademarks or registered trademarks of their respective companies or mark holders.